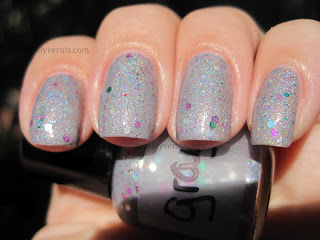 A dear friend, who I will refer to as "the holo hoarder" sent me this holographic creme for review. 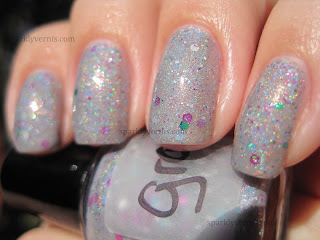 She collects holographic nail polishes, so she knows a lot about them. The holo hoarder has just opened an independent "indie" shop on Etsy, please check it out, and this is her facebook for updates on restock. This totally reminds me of Glitter Gal Light as a Feather, except this has glitter in it and more holographic pigment, so you can really see the rainbow on the nail. The formula was so perfect, let me just say I did not do my usual basecoat sandwich combo, the glitters lay flat, no Poshe basecoat or Gelous needed, it applied like a dream and dried fast. It has tiny glittery bits too that are so cute and feminine, much easier to appreciate in real life than in pictures. 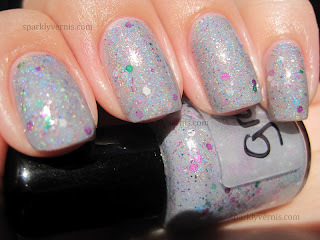 Gray Matter is not the only amazing nail polish from this shop, there is also another one that is very similar to Nerd Lacquer All of Time and Space, check out this comparison. And how clever is the name of this brand? Pound of Glitter, love it! I bought her Never Enough of These a bit back and love it! I can't wait for this one to be available so my greedy self can buy it. I hope she continues to create polishes. Duh! I didn't realize that comparison link was mine. *sigh* I think I need glasses. Oh, by the way, that Sally Hansen top coat is really great with holos. Thanks for the post about it. This is so unique! I love it, it's gorgeous! Ooh that's unique and glittery and holoy! !